0% Introductory APR for 15 months on Balance Transfers made within 45 days of account opening. After that a variable APR will apply, 15.24%, 20.24% or 25.24%, based on your creditworthiness. Please note, there is a fee for balance transfers. If the crisp smell of autumn, the sound of roaring crowds and the sight of Hail Mary touchdown tosses make your pulse quicken, it's a good bet you're a football fan. That fan status alone may make you a candidate for the NFL Extra Points Credit Card issued by Barclaycard, a cash-back credit card for people with a passion for pigskin. You're an even better candidate for the NFL Extra Points Credit Card if you anticipate rushing for National Football League branded merchandise, buying NFL game tickets and swiping the card for merchandise and other purchases at NFL licensed shops while attending NFL games. If you are all these things, the NFL Extra Points Credit Card is worth checking out with its reward structure that allows you to accumulate points toward cash back, NFL tickets and other kinds of exclusive NFL experiences you crave. Every NFL team starts each season with great potential, so, too, does your relationship with the NFL Extra Points Credit Card. You can earn 10,000 bonus points by making $500 in purchases on the card in the first 90 days. Those 10,000 points can then be redeemed for $100 in cash-back credit on your statement or for any number of other football-centric products and experiences. In addition to the intro offer, use your NFL Extra Points Credit Card to earn two points for every dollar spent on NFL game tickets, at team pro shops and within stadiums on game day. You'll also earn one point per dollar charged on all other purchases, with no cap on the number of points earned. Express your love for your favorite NFL team with a card that offers you opportunities to get closer to that team at a discount. Earn 2x the points on ticket purchases, NFLshop.com purchases and game-day stadium purchases. With no annual fee, there's nothing to offset the rewards you earn on your way to tickets and the ultimate fan experiences. If you're looking for easy cash back, but don't have a particular allegiance to the NFL, you can earn higher tiered rewards with other cards. If you don’t want to redeem points for NFL-specific products and events, you can still benefit. Just redeem your points for a statement credit, which means that you can buy your game-day tickets on your card and then redeem the points earned from that purchase (two points per dollar on ticket purchases) for cash-back statement credit. Redemption levels start at 2,500 points, and include options to redeem for single-game tickets, team jerseys, NFLshop.com gift cards and more in addition to the statement credit option. In addition to racking up points, the NFL Extra Points Credit Card also offers some discounts and perks when you make your purchases. For instance, use your card at NFLShop.com for an automatic $20 discount on every $100 you spend on team merchandise. And when you purchase game tickets from any participating NFL ticket office, you'll be eligible for an introductory 0 percent APR for six billing cycles from the time of purchase. After that, you'll face a variable APR depending on your creditworthiness. The card also offers an introductory 0 percent APR – this one for 15 months – on all balance transfers made within 45 days of opening your account. Finally, the card doesn't stick you with an annual fee, so all your rewards are just icing on the cake. When it comes to traditional cash-back credit cards, the return on the NFL Extra Points Credit Card isn’t great at just 1 percent for everyday categories. The card is obviously geared toward cardholders who make NFL-connected purchases on a regular basis and can count on that 2 percent return for ticket, gear and other league connected purchases. It’s also important to note that if you plan to follow your team across the pond for one of the games held overseas in recent years, you’ll be paying a 3 percent foreign transaction fee on all your purchases while there. NFL Extra Points Credit Card vs. Chase Freedom Unlimited®(This card is not currently available on CardRatings). If you’re looking for a flat-rate cash-back card to use for everyday expenses, the Chase Freedom Unlimited® offers new cardholders 3% cash back on up to $20,000 spent in the first year and then an ongoing unlimited 1.5% cash back on every purchase – it's automatic. Of course, if you do plan to make some NFL-related purchases, the NFL Extra Points Credit Card could help you make up that difference. Neither card comes with an annual fee, but both charge that 3 percent foreign transaction fee. 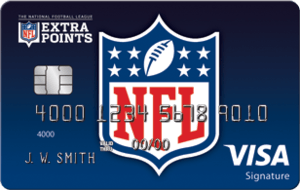 NFL Extra Points Credit Card vs. Citi® Double Cash Card - 18 month BT offer. (Citi is a CardRatings.com advertiser) The NFL Extra Points Credit Card offers your 2 percent back on your NFL ticket and purchases at team stores and the pro shop, but the Citi® Double Cash Card - 18 month BT offer offers you 1 percent back on all your purchases when you buy and another 1 percent when you pay your bill. That means you could, in theory, collect 2 percent back on your NFL purchases with the Citi® Double Cash Card - 18 month BT offer. The Citi® Double Cash Card, however, does not offer you a discount at NFLShop.com nor the opportunity to redeem points for exclusive VIP access to your favorite team. Who Should Get the NFL Extra Points Credit Card? When matched up across the line of scrimmage with other rewards cards, the NFL Extra Points Credit Card does have some things going for it. In addition to the lack of annual fee and discount offer on all NFLShop.com purchases, cardholders also receive the travel accident insurance and purchase protection policies associated with all VISA Signature Cards. Signing up for the NFL Extra Points Credit Card could make sense for those who are committed fans of the NFL since the card offers bonus rewards for purchases they would make anyway, like game tickets, licensed NFL gear and in-stadium purchases, in addition to 1 percent back on everyday purchases.